Need a one-time haul to the landfill? Or simply a helping hand to get a load of gravel, soil or debris picked up and delivered? 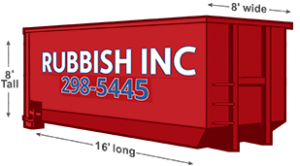 RUBBISH INC™ hauling offers a simple and timely solution. Give us a call today and take advantage of our flat rate hauling services. We’re open for work 24 hours a day, 7 days a week. Our junk/trash trucks are capable of carrying up to 20 yards of material per load. RUBBISH INC™ junk removal services are great for small to medium sized remodel projects, landscaping, and to be honest, really any project you’d like fast, reliable hauling when you truly need it. We are true to our claim and we will haul your trash or materials anytime of the day any day of the week. We have a great staff with years of experience in construction, hauling, and debris removal. Please do no hesitate to call us with any questions about renting or having a trash dumpster delivered to your site. If you can’t reach us via phone, absolutely shoot us an email or even easier, fill out the RUBBISH INC™ contact form on our home page. We look forward to hearing from you and providing you the customer service you deserve. No hazardous materials including liquids, chemicals, asbestos, paint, gas, oil, and biological/medical waste. Get an Estimate Over The Phone or Via Email. Schedule a Convenient Two-hour Arrival Window. Let Our Crew Load & Only Pay for the Space You Use!